I had to work today at 2 pm so my time on the ice was limited. I got an early start and was set up only a few minutes after 6. From 6 until 9:30 I had three flags. All were hit and runs with no line stripped out. The fishing was not great but I had a back up plan. I packed up and was on a new body of water in no time. The second spot I checked was a little more promising. Upon arrival I punched a bunch of holes over varied terrain looking for weeds of all kinds. The fish in this lake usually relate to the thickest weeds during the mid day. Being that the fish hasn’t been pressured much here this year, the circumstances were different. 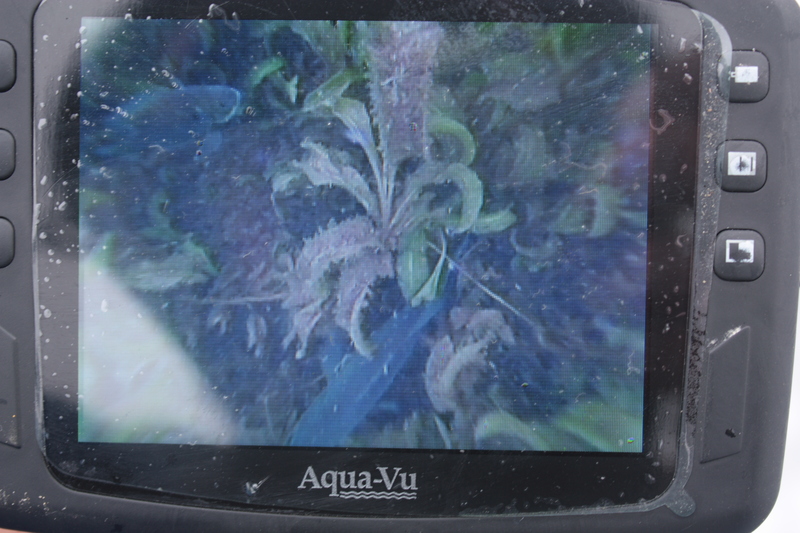 After cooling off for a second, I started checking holes with my underwater camera. The majority of the holes were barren with weeds only a few inches tall. I found a few holes about 20 minutes in that held fish on a slight taller weed edge. As I watched the fish, they were actively feeding and a good population of bass was around. 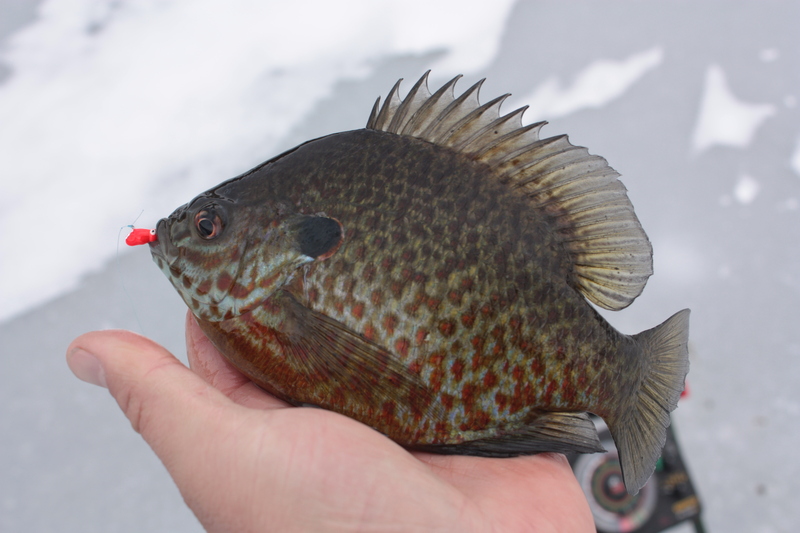 I found the bluegill cruising above the weeds and the pumpkinseed slightly tucked down into them. As I started fishing, I found that the fish were feeding aggressively and plastics were not the key for this trip. The jig head color didn’t matter as long as I was using meat. 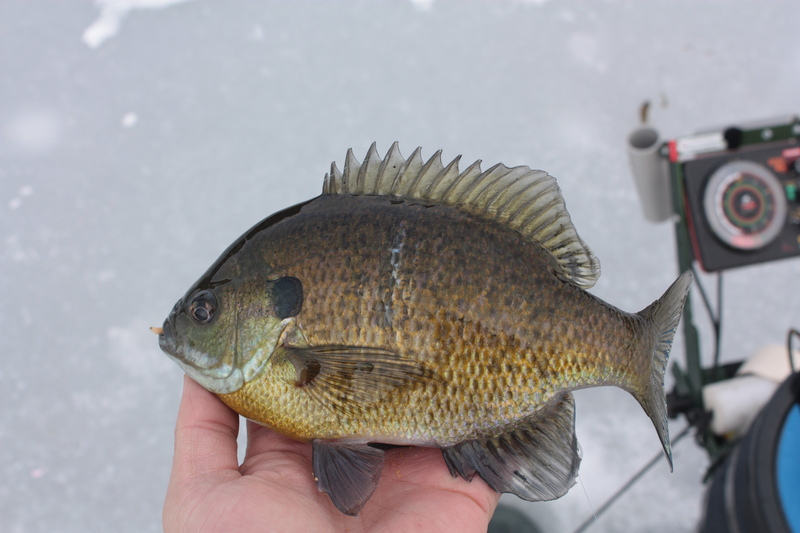 As the fish started to come through the ice, I found that the best depth for the bigger gills was 5′ below the ice in 8′ of water. By the end of the day, I had started sight fishing them as my jig head was bright enough. The trip ended up being turned around into a success but made it so much harder to leave and go to work. I’m sure that I will be back soon! Check out Frontal Feeding on Our YouTube page for more action!